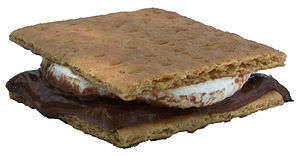 August 10 is National S’More Day. That campfire treat that we’ve been enjoying since we were kids actually has its own day. It’d be futile for me to count how many s’mores I’ve had in my lifetime — but who is counting anyway? What’s more important that they’re still enjoyed by this older mittenkidz to this day. While the traditional recipe — one or two marshmallows, topped with a few squares of Hershey’s Milk Chocolate and sandwiched between two graham crackers — is tasty as it is, my adult taste buds have appreciated the slight tweak we’ve made to the recipe. Rather than milk chocolate, we use dark chocolate. It tones down the sweetness of the marshmallows and has me coming back for seconds. I’ve also heard of people replacing the milk chocolate with the likes of Reese’s Peanut Butter Cups and York Peppermint Patties… What’s your favorite s’more recipe? This entry was posted on August 10, 2013 by mittenkidz in Summer Fun and tagged camp recipes, camping with kids, national s'more day, Pure Michigan, s'mores recipe.